PRI Orthotics are custom arch supports that are created based on solid principals of lower extremity biomechanics. While PRI Orthotics were specifically designed for patients of the Postural Restoration Physical Therapy program, they are offered to many other medical professionals such as podiatrists, chiropractors, athletic trainers, medical doctors, etc. Health care providers often determine that PRI Orthotics may be useful in a patient’s course of treatment to help them attain their therapy goals and ensure their lasting success. PRI Orthotics are shoe inserts that change the mechanics of the feet and lower extremities to correct foot function. Dr. Coffin’s strategy is to make them highly conformed to the shape of the foot; non-compressible to provide support; and flexible to allow a normal gait cycle. They are designed to be highly controlling and matched closely to the foot and shoe to achieve this goal. The materials used are flexible and non-compressible to create a comfortable supportive device. No hard plastics are used in Dr. Coffin’s lab. 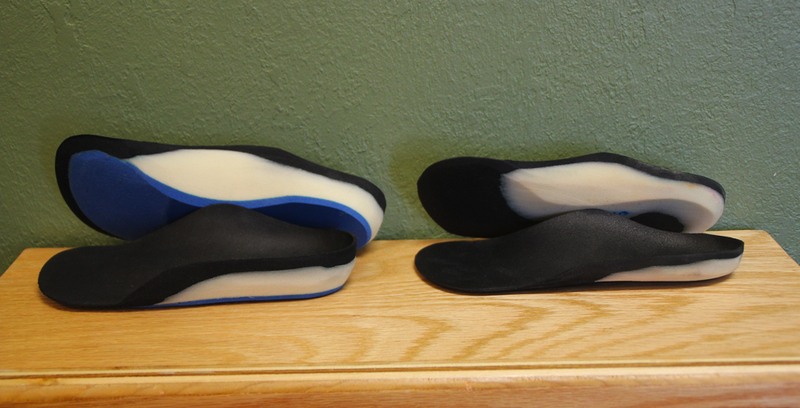 To obtain these custom orthotics for their patients, the health care professional uses a common foam impression system. (Some orthotics labs use a high tech scanning system; however, this is expensive and not reliably accurate.). The therapist or practitioner will use their knowledge of anatomy to correctly align the foot, knee and leg in optimum position. (SEE VIDEO) The therapist or doctor will collect relevant information such as shoe size, type of shoes worn, diagnosis, activity level and type of sports participation, if any. These impressions will be mailed to the PRI Orthotics Laboratory in Sioux City, IA, where Dr. Coffin and his staff will build your custom foot supports from high quality materials. They utilize measurements, photographs and further information provided by the health care provider to create a truly custom orthotic designed only for the anatomy and symptoms of that patient The lab mails them back to the therapist or doctor, usually within two weeks of their receipt. The therapist or doctor dispenses them to the patient and follows their progress, consulting with Dr. Coffin when necessary. Who can benefit from PRI Orthotics? to slow down genetic pre-dispositions to foot problems such as bunions, hammertoes, etc. to address foot problems related to poor foot function such as plantar fasciitis, tendonitis, frequent ankle sprains, etc. to avoid or postpone surgical procedures being considered for changes in bone structure. Dr. Paul Coffin, a podiatrist from Sioux City, Iowa, has spent more than 30 years experimenting with and perfecting his orthotic appliances. He fabricates non-compressible, flexible orthotics that are uniquely matched to the patient’s structure, gait and activities. They are closely conformed to the foot and are lightweight yet durable. Dr.Coffin has extensive knowledge and has spent many years researching the biomechanics of the foot. He works to ensure that the orthotics will line up your joints so they function optimally. Dr. Coffin is very involved in the manufacture and personally completes several steps including the finishing of each pair to the specifications provided by the therapists and doctors. He has studied postural restoration techniques and understands the goals of their program. With a strong background in biomechanics of the foot and lower leg, Dr. Coffin has always personally fabricated custom orthotics for his own patients. In response to requests from therapists trained in postural restoration, Dr. Coffin now also makes orthotics for numerous physical therapy, podiatric and other health care clinics. Although basically the same in purpose and function, PRI Orthotics have several unique characteristics that address the needs of Postural Restoration patients in their therapy programs. Dr. Coffin introduced PRI Orthotics about ten years ago with the collaboration of Ron Hruska, PT of Lincoln, Nebraska. Ron is the founder of the Postural Restoration Institute that trains hundreds of physical therapists each year in the principles of Postural Restoration Physical Therapy. It is the innovative minds of Dr. Coffin and Ron Hruska, PT, both experts in their fields, uniquely combined to pair the biomechanics of podiatric medicine with postural restoration physical therapy. Their professional skills, along with the genuine interest in helping therapists with their patients, creates PRI orthotics designed to help people function more efficiently by realigning the entire lower extremity. Over the counter foot supports are widely available in stores, on television and online. These inserts may work to some degree but their effectiveness is very limited. You cannot expect that standing on a machine in a health and beauty department will capture the twists and turns of your foot function as you walk. It is kind of like buying standard reading eyeglasses at a discount store. Many other prescription orthotics are created out of a rigid plastic with wedges or pads added to change the foot position. These may be an effective treatment for some, but Dr. Coffin’s orthotics, highly contoured to the foot, can offer a higher degree of support while still being flexible and extremely comfortable. The orthotic must be able to flex during the gait cycle while still providing maximum support. Dr. Coffin has experimented with a variety of chemical polymers and has developed materials of the appropriate density and flexibility. He also determines which covering material and shock absorbing materials will perform best for each patient based on their foot type and level of activity. Eight stages involved in building PRI Orthotics. Dr. Coffin grinds the orthotics to create a custom fit. What is the cost of the PRI Orthotics? We’ll be happy to share our prices with therapists and other health care professionals who contact us directly. Can patients buy the orthotics directly? PRI Orthotics are only available to health care professionals who offer them to their patients. Under normal conditions, orthotics should last two years or more. Many people wear the same pair for over five years. Athletes and those who spend a lot of time on their feet may need replacement sooner. How long will it take for the orthotics to be comfortable? Because of the changes in your foot function, there may be a break-in period. Athletes should be comfortable walking in them before vigorous training or wearing them in competition. Most patients are comfortable in their orthotics within two weeks. Some who have been experiencing the pain of an injury or poorly functioning feet may take longer. What if the orthotics need to be adjusted? The therapist should mail the orthotics back to Dr. Coffin’s lab for adjustment. Please complete and include the “Orthotic Adjustment” card describing the problem. What if the orthotics don’t fit into my shoes? It is advisable to remove the original shoe liner before inserting the orthotic. Orthotics perform best on a flat surface inside the shoe. If left in, the liner will force the orthotic too far forward in the shoe. Orthotics can be altered to fit into specific shoes. The therapist can attempt the adjustment or mail the orthotics back to the lab for modification. Patients may have to buy shoes that are one half to one size larger than usual. Encourage them to wait to purchase new shoes until they have the orthotics. Our orthotics are designed to fit well into athletic style shoes and other supportive tie sheos. Orthotics can be made to fit specific type shoes if we know ahead of time, although some control may be lost by cutting them down. Shoes that do not provide stability in the heel will decrease the effectiveness of PRI Orthotics. For people who spend a lot of time in dressier, slip-on shoes, we can make low profile or leather orthotics which are less bulky. Why aren’t all of the orthotics full length? There are several reasons Dr. Coffin prefers orthotics that are ¾ length and not to the tip of the toes. Full length orthotics often cramp and irritate the toes. Dr. Coffin prefers that the patient’s toes are forced to curl down a bit in the push off phase of the gait cycle. It is much easier to fit ¾ length orthotics into various shoes. Those who insist upon full length orthotics, must make sure the therapist clearly marks it on the prescription card and includes a tracing of your preferred shoe’s liner. Even then, there may be variances and discomfort under the tips of the toes. There is no way to make the ¾ size longer one they are made and so a new pair must be made and charged. How do I know if the orthotics are helping my postural restoration? Your therapist will schedule a follow-up appointment to evaluate the fit and effectiveness of your new positioning in orthotics. Orthotics may be changing years of foot, muscle and tendon dysfunction. With improved biomechanics, the entire lower extremity will function more efficiently, laying the groundwork for effective postural restoration. Who can I contact about the orthotics? Dr. Coffin is happy to consult with physical therapists or health care professionals who have prescribed PRI Orthotics. He cannot, however, speak directly with patients since he has not evaluated or treated them. You and your therapist or doctor are a team who should be communicating regularly about your progress. How do I order a second pair? The PRI Orthotics Laboratory keeps the foot impressions for one year. If you desire an additional pair, contact your therapist who will submit the order to the lab. They will collect the payment for this second pair as well. What kinds of shoes work best with PRI Orthotics? We encourage therapists to counsel their patients about appropriate footgear. Success with orthotics will depend upon their compliance in wearing the orthotics in supportive tie shoes the majority of the time. Stress to your clients that soft shoes create injuries. Shoes that feel as comfortable as bedroom slippers in the store, will certainly not provide the support needed to keep the foot operating in a supported optimal position. Cushioning is not needed in the heel, but the forefoot, where the action takes place in most activities. It is important to explain to patients that orthotics are not a “quick fix.” Just as therapy can be a slow and steady process, it will take time to see changes with the use of orthotics. Orthotics are treating the cause of the problem, not just treating the symptoms. People who have been functioning at less than ideal position for years, may take awhile to learn a new way of operating. In the case of injury, it takes time for ligaments and tendons to heal. The orthotics realign the joints of the foot, keeping them in their mid range of motion, taking the tension off the injured part, allowing it to heal.